It is no mean feat to come back 400m from one race to the next but that challenge proved no hurdle for the flying Son Of Sami who was so impressive taking out the Prancing Horse Estate Handicap at Mornington on Monday. Jumping straight to the lead - wanting to over-race from the barriers to the turn, Son of Sami proved just too fast for his rivals whom he had off the bit a fair way out. Giving a good kick at the turn, the flashy chestnut was challenged late but just kept digging, jockey Alan Creighton noting that "he stuck his neck out well." "He has always had speed," he said, "though he did surprise me a bit today coming back from the 1500m to the 1000m, he was just too quick for them." "He got a bit tired late but he was entitled to." A lightly raced winner of two of his 12 starts, the five-year-old son of Magnus was having his first run since mid-December, Rick keeping him ticking over well over the last few weeks. "He is rock hard fit so we have just trotted him up at home with the odd swim and he did a bit of evens the other day - that's all we have done with him in the last few weeks, when they are fit they are fit!" Son Of Sami has done a good job to even get to the races let alone win, having severely injured himself during the winter of 2014 when kicking a wall and severing a tendon over the hock - two lots of surgeries required to fix it. "It was amazing that he survived," said Joanne Malloy, "it is testament to just how tough he is." Raced by RWH Thoroughbreds (manager Joanne Malloy), R G Webb, Mrs M Webb, F H Gibbs, D Spicer, H Barclay, D H Vidovic, A G Heydon, M Albones, A Jones, D Randall and A L White, Son Of Sami was a bargain $10,000 purchase at the 2012 Adelaide Magic Millions. Bred by Flying Fox Stud, the son of consistent stallion Magnus is out of the Group 3 placed Ashkalani mare Ansami. 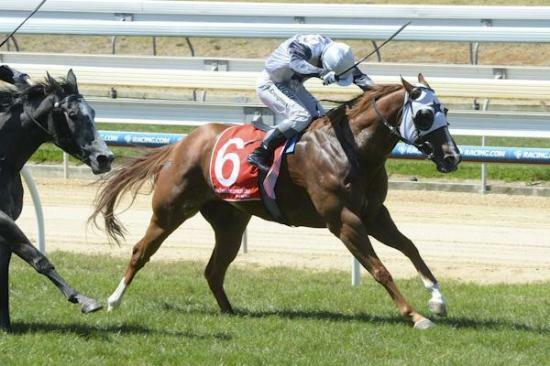 Also dam of the three times winner Keen Soul, she is a daughter of the speedy stakes winning Marscay mare Martelomeo.